Over the last couple weeks or so, I’ve been sharing fun recipes from our Disney’s Descendants movie watching party. Don’t forget to check out the DIY spell book and Shards of Glass cupcakes. 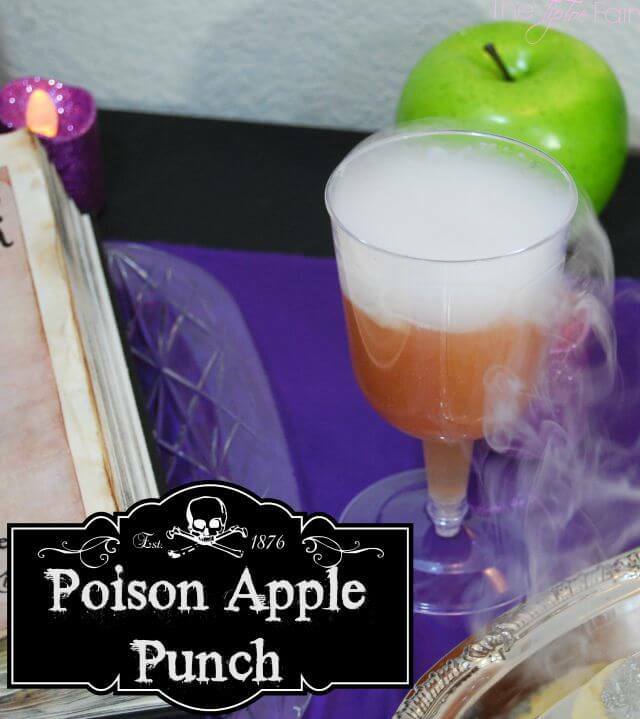 Today I’m sharing a fun drink for all you Evil Queen (or Snow White) fans — Poison Apple Punch! This will be perfect for your upcoming Halloween parties, too! During the Fall and Winter seasons you can find big bottles of Apple Cider in the juice aisle right next to the apple juice bottles. I think the apple cider gives it a bit of spice with the addition of clove and orange flavoring. But, you can totally make this punch with regular ol’ apple juice, too. 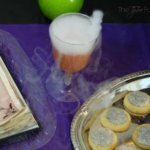 I love the fun of adding dry ice to party drinks, especially for added spooky effects. You certainly don’t need to add it to enjoy this delicious punch recipe. It’s just an addition to make it a little extra special. I know you can find it at Kroger. I’ve bought it many times there. I bring some kitchen towels and one of those totes that keeps things cold with a silver lining. You can also just grab a styrofoam cooler. Dry ice can evaporate fast, so if you want to keep it going for the whole party, you’ll need to buy 3-5 pounds and keep it covered before use. 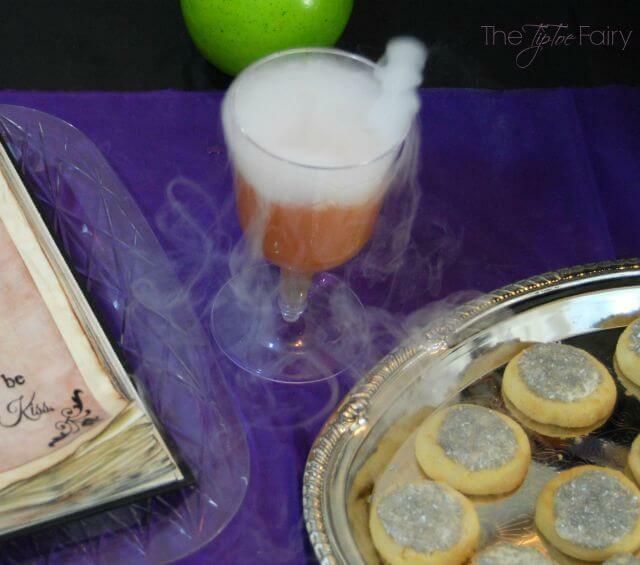 A themed punch perfect for your Snow White or Evil Queen party – great for Halloween parties! 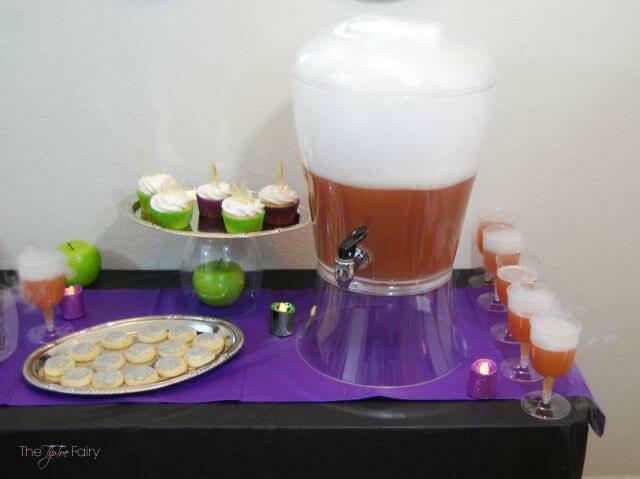 Combine all the drinks together in a beverage dispenser or punch bowl just before the party. Use heavy gloves and a clean hammer to break up dry ice into chunks. Add several pieces to beverage dispenser. Add a 1-inch piece to each glass when serving. What’s your favorite Halloween theme drink? OMG I love this so much! What a neat idea for a Halloween party or even just to surprise the kids after school one day near Halloween. How fun and spooky! Thanks for sharing! That is going to be great for Halloween! I bet it tastes awesome too! I’ve never known where you could get dry ice. I’ll have to check my local Kroger chain. Okay yum yum yum. This is such a great idea for fall parties and get togethers. And it sounds delicious. Sounds so delicious, and looks so fun too! 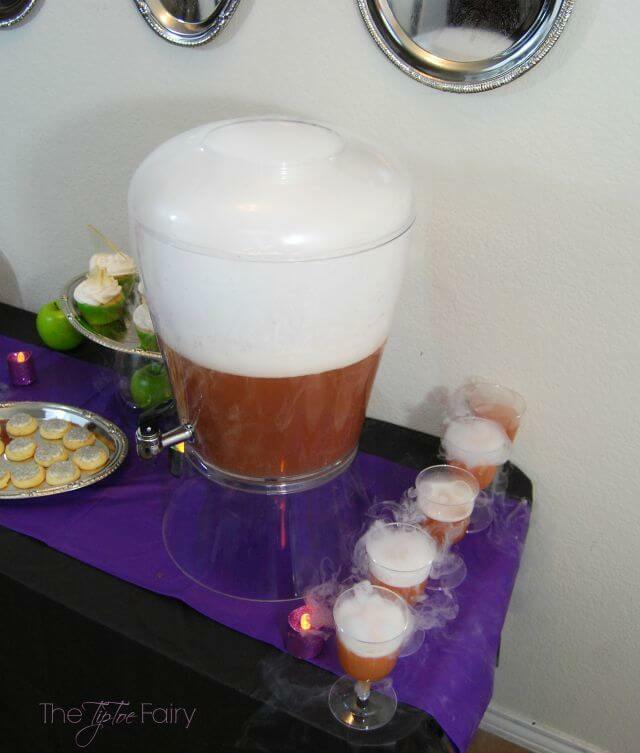 I love that you incorporated the dry ice – It gives it that creepy feeling, but keeps it fun. You are inventive. I like the ideas I’ve been seeing for Halloween. I love this recipe. I love the dry ice aspect. 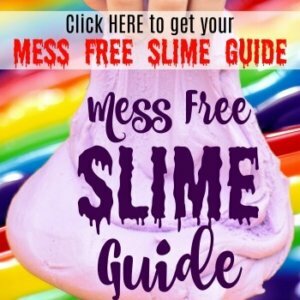 How much fun would the kids have doing this! This looks so cool! I will definitely try this out for the upcoming Halloween. Thank you for sharing! I am just not ready for Halloween posts yet. My kids haven’t even started school yet. This is a fun recipe though. Dry ice… that is cool. This looks like fun and sounds delicious! I am going to bookmark for our party this year! Thanks for the idea and what I love most – its SO easy! I went to a restaurant before that had a drink that ‘smoked’ like that. I always wondered what made that type of effect… and now I know. This is an awesome idea and sure to be a hit at any halloween party! I will be bookmarking this to make for ours. This would be fun to make if my son decides he wants to do a Halloween Sleepover this year. Or I might just make it for a movie night and hunker down in my blanket and pj’s and watch Snow White for a girls night out.